Every year there are fashion weeks held on a large scale in India where we can catch a glimpse of new collections. Lakme Fashion week is one of them! This is the place where you will find the best designer collections and also the latest fashion trends all under one roof. This is where the future of fashion gets decided and we, the people follow it in our day-to-day lives. 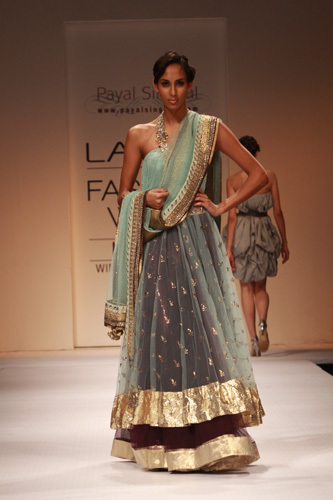 The recent fashion week to take place in India was ‘Lakme Fashion Week’s Winter/Festive’ Shows held in Mumbai. Top notch designers showcased their recent work while a throng of celebs attended to walk the runway or cheer their favourite designers. Here is your look to the new trends that are making waves in India and how you can wear them! Incorporating ‘Art’ in ‘Fashion’ is the new way of presenting ‘Couture’ on the runway. It is already popular in the west where famous artwork are often seen on the outfits as well. But of late this trend has become a rage in India. Designers like Meera & Muzzafar Ali displayed sarees, stoles and gown with elaborate artwork spread across the silhouette at Delhi Couture Week. 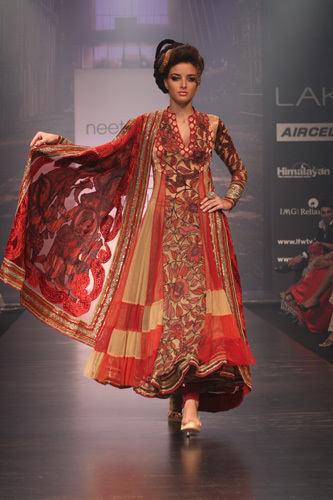 Designer Neeta Lulla had presented a collection at Lakme Fashion Week which had an Indian art form called ‘Hastkala Kalamkari’from the Indian state of Andra Pradesh [seen above in the picture] The artwork designs were seen on Sarees, Anarkali, Lehengas in this colourful ensemble, they looked absolutely ‘Divine’ on the runway. Flaunt a work of Art on the pallu of your Saree, drape it around your neck in form of a stole or just let it sway in form of a dupatta. Who says ‘Art’ looks good on the wall only? 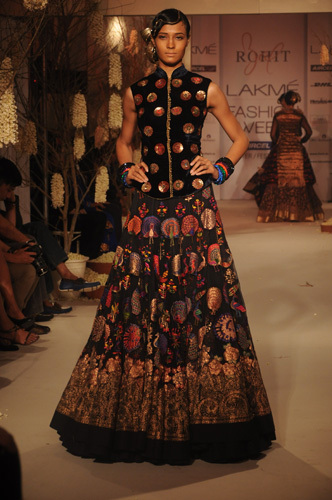 It’s good to see knee-length Kurtis and Anarkali make a comeback at LFW Winter/Festive. This is one trend which will suit any women’s figure. For day wear try going for short kurtis coupled with a vest, trouser or churidhar for that fashion forward look.For the evening glam it up by adding a dupatta or a stole with high heel stilettoes for the desired effect. Eminent designer Sabyasachi Mukherjee had showcased knee-length kurtis & Anarkali [Seen above] combined with churidhars, wide leg pants and flared patiala salwars. So come this fall, you can boldly go short. 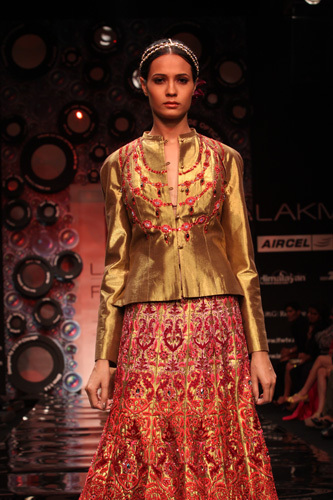 Jackets were seen in every show at Lakme Fashion Week – Winter/Festive. Waist fitted jackets, knee –length jackets, bolero, caraco – you name it.Usually the traditional way of wearing a lehenga has always been with a choli, but fashion is all about breaking the norm. JJ Valaya has to be one of the pioneers for showcasing his ‘Alika’ jackets with Lehengas [seen above], sarees and even churidhars. Try combining knee length jackets with an elegant saree! Make sure that either the jacket or the saree is heavily embellished with embroidery for that rich festive look. 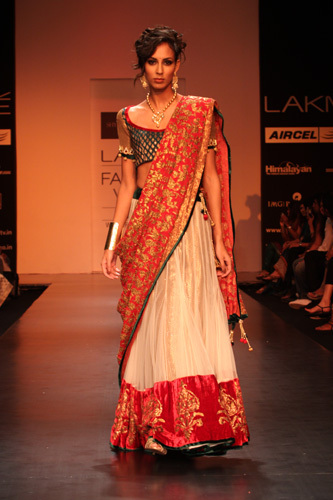 If your Lehenga is loaded with detail work, then go simple on the jacket. By pairing your lengha or saree with a jacket you can revamp your saree/lengha collection by giving it a very contemporary look. ‘Color Blocking’ was one of the recent style trend seen at LFW where two or more different colors are combined to create an outfit. They are usually used in solid ‘whole’ form and not in patterns or prints. The above photo from Manish Malhotra’s recent collection is a clear example of ‘color blocking’ where solid pink and solid ‘bittersweet’ orange shades are combined to create this Anarkali. The same technique of ‘color blocking’ can be tried with other Indian attires, like pairing a lehenga in cool color like blue, green or purple with pastel colour choli and a bright colour dupatta. You can also add neutral hues in form of shoes or clutch to tone down a bright color outfit. ‘Color blocking’ was also seen in collection by Anita Dongre, Nachiket Barve and Neeta Lulla. 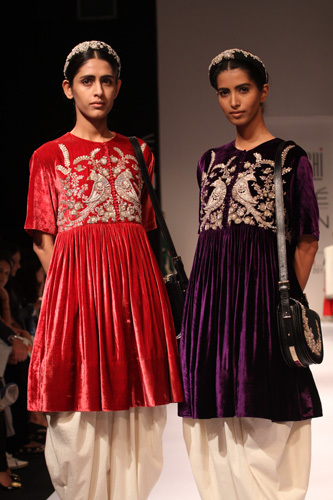 The recent trend seen at LFW was all about velvet trimmings, detailed work on velvet and velvet cutwork. You can combine velvet with other flowy fabric like chiffons or crepe to get the desired effect in an outfit. Avoid wearing velvet ‘Top to toe’ instead opt for subtle use of the fabric which looks very alluring, something that you can wear all year round. Embroidery work on velvet is a big rage this fall/winter season. A touch of velvet was seen in the collections of Rohit Bal, Anita Dongre, Manish Malhotra, JJ Valaya, Sabyasachi and Neeta Lulla. 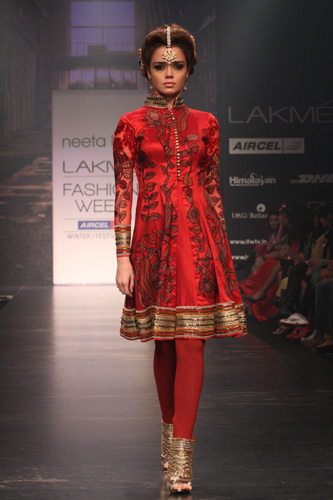 We loved to see velvet cutwork in so many Indian outfits! It gives ensembles a rich and regal look. Sarees & Lehngas in chiffon had velvet trimmings on it’s hemline was something ‘new’ this season. As seen in the above picture, Designer Rohit Bal has combined a velvet bodice with a flowy skirt with all over ‘Kashmiri’ detail work showcased at the recent LFW. beautiful,elegant are most of them.